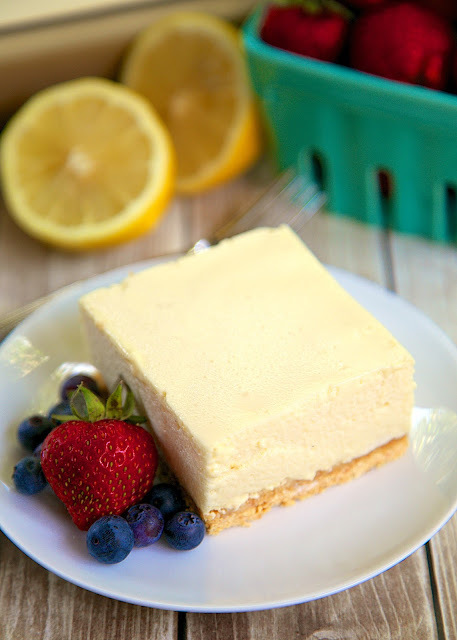 No-Bake Lemon Cheesecake Recipe - graham cracker crust, light and lemony no-bake cheesecake - SO good. 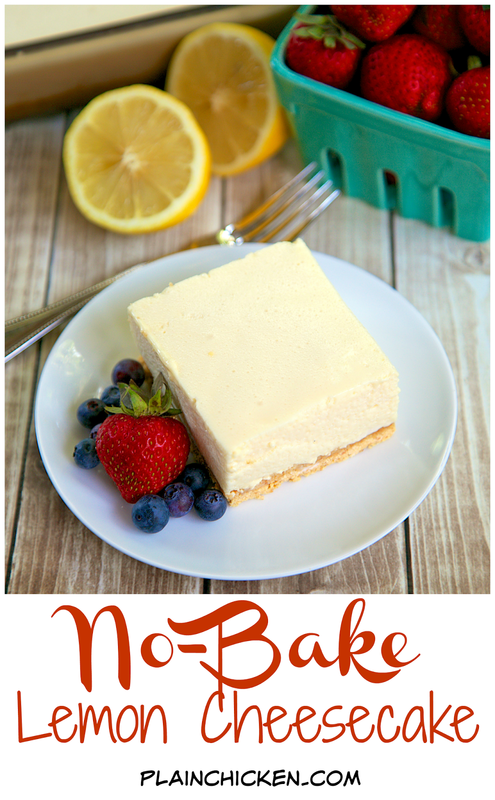 THE BEST no-bake cheesecake EVER! Great with fresh berries. 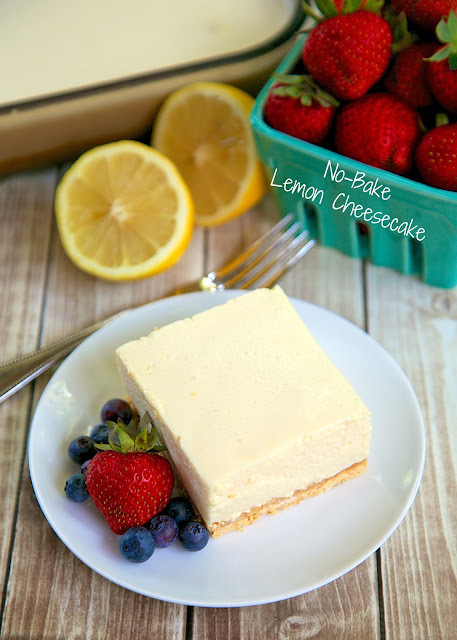 This No-Bake Lemon Cheesecake is crazy good! It is hands down the best no-bake cheesecake we've ever eaten. This only took a few minutes to whip together and it sits in the fridge until you are ready to serve it. It will be set after a few hours, but it is 100 times better if you can let it refrigerate overnight. It takes a lot of self-restraint, but it is totally worth the wait! This cheesecake has a somewhat unusual ingredient for cheesecake - evaporated milk. You whip the evaporated milk to make the cheesecake light and fluffy. Before this recipe, I had never whipped a can of evaporated milk. It whips up quickly. Make sure to use a large bowl, because it expands a lot when you whip it. Dissolve Jello in boiling water. Add lemon juice. Allow to cool. Cream together cream cheese, sugar and vanilla. Add Jello and mix well. Whip the evaporated milk and fold into the Jello mixture. Mix graham cracker crumbs and powdered sugar with butter. Press into the bottom of a 9"x13" dish. Pour in filling. Chill overnight before serving. That would be hard to resist in the refrig overnight. My mom had a recipe just like this - only it was made with Milnot, not evaporated milk (there's a difference). It also called for you to chill your mixing bowl and beaters before whipping the Milnot...it was the best cheese cake ever! I have not made it in years, only because (1) Milnot is hard to find in our area for some reason, and (2) I shouldn't be eating too many sweets, and this one is definitely hard to resist! Thank you. Making this day. Carol this is the recipe that Grandmother used except she added an 8-oz. can of crushed pineapple - absolutely delicious. Drain pineapple then add to Minot mixture at the end. Hope you enjoy!